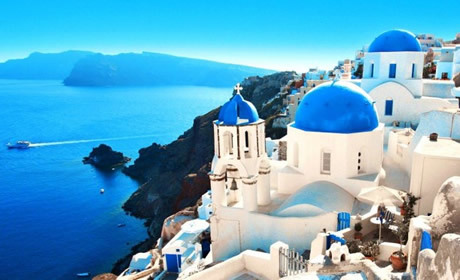 This special clothing optional gay sailing cruise takes you along the Southern Cyclades Island to the spectacular island of Santorini. This is the best place on earth to watch a spectacular sunset! After one week we will finish again on Mykonos. We sail with two new spacious air conditioned Bavaria 56 feet sailing yachts with room for 11 gay guys each. Boarding starts by 5 pm. After meeting with your Gay Crew in the afternoon, you will be given some tips to explore the rest of this amazing island on your own. It is no coincidence that this, the most cosmopolitan of all Greek islands, attracts so many visitors from the entire globe. Here the steep mountains to be encountered in most of the Cyclades islands give way to low, rocky hills which combine with superb gay beaches. The capital Hora, with its colorful harbor in which little fishing boats nest happily side by side with luxury yachts, presents quite a different picture from that of the majority of Aegean island towns. 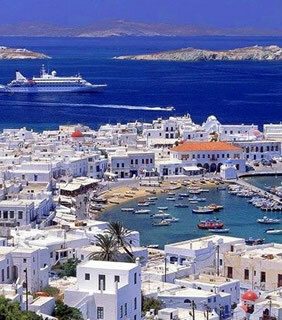 Mykonos is spread out over a flat area, and the whitewashed streets stand as brilliant white cubic houses with stepped walls for sitting on. Dinner together in Mykonos town Hora and time to explore the local gay life! Time to sail back to Mykonos. If we are in time we anchor of in front the famous Elia gay beach for swim stop and a drink. Mooring in the marina.. It's a nice way to end this week over a cocktail watching the drag queen shows next to the pool in Elysium while the sun is going down. Dinner and party (if you like) in town. Our trip will end here (10:00am) in the stunning waters of Mykonos. After an on board breakfast we say goodbye to our new friends, and disembark the vessel. The Marina is called "The New Harbor" and is opposite the cruise ship dock. You can take a boat bus from the old port, a regular bus or a taxi.